A healthy fall or winter appetizer - great for Thanksgiving, the holidays, or just for snacking! Vegetarian, vegan and gluten free. 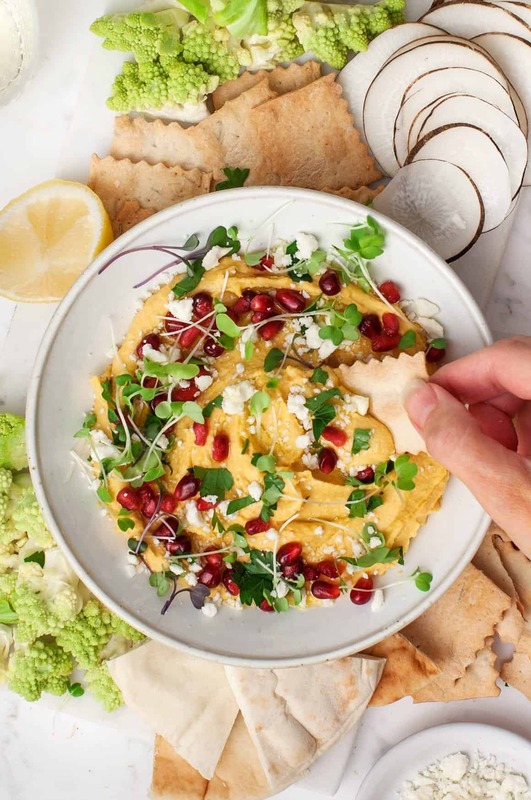 I hope you need a last-minute Thanksgiving appetizer because this butternut squash hummus dip is so insanely good! While I was making it, I couldn’t stop eating it. Now that the leftovers are in the fridge, I can’t walk by the kitchen without grabbing a cracker for a quick swipe. It’s easy to make, especially if you’re roasting butternut squash for another recipe – just roast an extra cup of cubed squash and swirl this hummus together in no time. It’s thick, creamy, tangy, and nicely spiced from the cumin, coriander, and a bit of cayenne. Now the important part – what REALLY puts this dip over the top is serving it all fancy with feta and pomegranates. 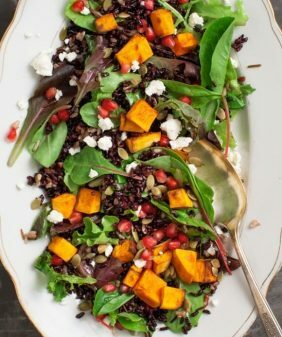 The feta adds a nice salty bite and the burst of sweetness from the fresh POM POM pomegranate arils brings such a delicious pop of flavor, as well as a contrast to the feta. Plus that ruby red color is so pretty for the holidays! I served my dip with crackers, pita, sliced black radish, and chopped up romanesco – I think the little green romanesco trees look so festive for the December holidays that are just around the corner! Preheat the oven to 400°F and line a baking sheet with parchment paper. Place the squash on the baking sheet and toss with a drizzle of olive oil and a few pinches of salt and pepper. Wrap the garlic cloves in foil with a drizzle of olive oil and a pinch of salt and place on the baking sheet. Roast for 20 to 25 minutes, or until the squash is tender. Let cool slightly. 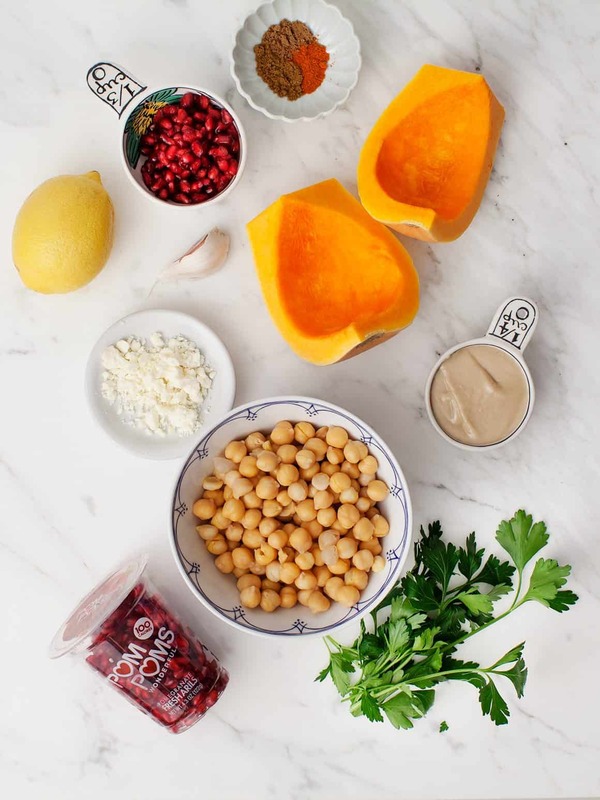 In a food processor, combine the roasted squash, roasted peeled garlic, chickpeas, tahini, lemon juice, cumin, coriander, cayenne, and sea salt. Scoop the hummus into a serving bowl and top with pomegranate arils, feta, parsley, microgreens, if using, and a drizzle of olive oil. Serve with toasted pita, crackers, and/or chopped veggies. I have been a hummus purist since I learned to make it from a Lebanese boyfriend about 50 years ago. The stuff I learned to make had no spices like cumin (I think that’s an Israeli thing). 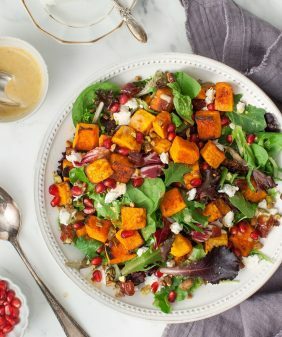 But this idea really got to me because I love butternut, pomegranate and feta and the combo sounds enticing. Not sure when I’ll have use for this recipe but I’m definitely keeping it. I will look for an excuse to make it. Gorgeous pictures and such a unique dish. Looks amazing. Just found your blog and am enjoying it! Wow that looks sooo delicious and great! 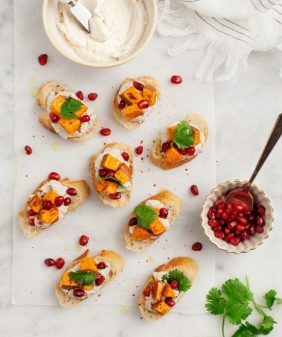 Nice idea to combine humus, pumpkin, feta and pomgranate seeds! 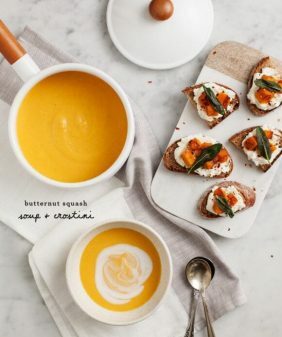 Such an amazing fall twist on one of my fave dips EVER! 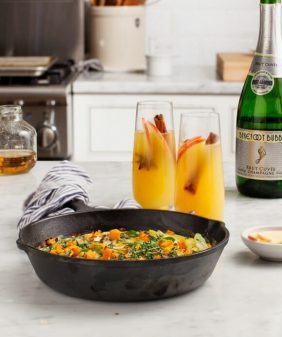 This sounds perfect — we just got a butternut squash in our CSA share, and I want to do something with it other than making soup. Plus, we’ve got a big bag of tortilla chips just screaming to be dipped into something yummy! Love the tart pop of pomegranate seed, too! I hope you love the dip! I always forget about the appetizer, so I’m all over this pretty dip! What a stunning hummus! Love that the toppings are simple but contrast nicely. I could see this making a fabulous base (or topping) for a quick meal too. I made this to bring as an appetizer for a Thanksgiving gathering. It was delicious and a huge hit! Hi Rose – yay, I’m so glad it was a hit! that is some really creative hummus! 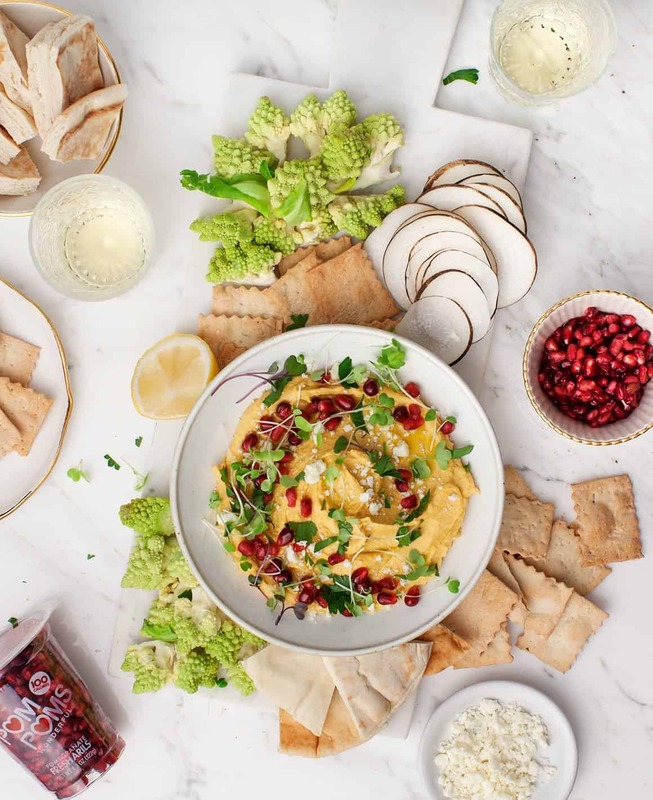 Pomegranates are the perfect addition, not only for nutritional pop but also for the flavor and to balance that with feta is the perfect tweak to this and a very high level of flavor over my own boring hummus recipes, so thank you for this recipe! Hmm. Auto correct. Arils are…. Hi Nancy, I’d say it’ll keep in the fridge for about 4 days (without the toppings). Hope that helps! Has anyone made this by adding the roast squash to purchased store hummus? Another great recipe Jeanine! I am making my second double batch today to keep the holiday party season going. 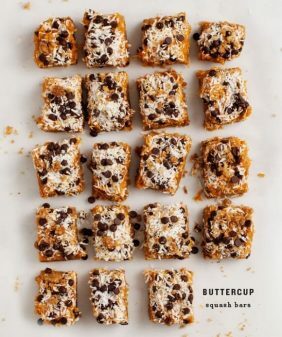 I have been getting a lot of rave reviews from those eating it… and I have been passing the recipe along to them as well. Thank you for keeping us well-fed! This is great! Don’t shy away from the cayenne. Hi Lori, I’m so glad you loved it!